Ireland was once covered in broadleaved trees. Most of our native woodland was destroyed over the centuries and along with it the rich ecosystems it supported. 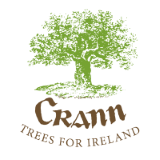 Crann promote the sustainable use of Irish grown hardwoods, develop public awareness of the value of our woodlands and encourage the art and crafts associated with our native grown timber. We cannot continue these tasks and our work of education and promotion without your help. No matter how small your legacy or bequest is, Crann will put it to good use towards safeguarding our woodland and hedgerow resource for the future. A legacy or bequest to Crann is a gift of trees for future generations to value and enjoy.